The Multi-National Corps–Iraq logistics staff and the Iraqi Security Forces (ISF) support operations cell, an element of the Iraqi Assistance Group, merged at the operational level to publish plans, policies, and procedures that met the strategic aims of the coalition forces, the national goals of the government of Iraq, and the joint campaign plan published by Multi-National Force–Iraq. Corps sustainment planners published operational objectives for execution at the operational and tactical levels in an effort to develop a sustainment-based system for the ISF. 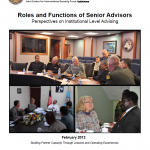 Based on experiences and observations over the past 18 months, the partners, advisors, and planners gathered the best practices for advising and assisting security forces at all levels of the sustainment system. This handbook presents partnering considerations in developing a fundamental base for a self-sustaining, host nation security force. In warfighting and counterinsurgency operations, partnering is a command arrangement between a US security force and a host nation (HN) security force in which both forces operate together to achieve mission success and to build the capacity and capability of the HN force. Partnering is not an end, but a deliberate process, a means to an end. A near-term goal might be the standup and development of a HN force increasingly capable of independent operations and decreasingly dependent upon US partnered support. An intermediate objective might be the transition of lead security responsibility from US to HN force. But the ultimate goal is to become “un”-partnered, to enable the HN force to assume full responsibility for security and stability. In warfighting and counterinsurgency partnering, divorce is not a bad ending, it is the desired outcome.